WFP food distribution in Kaga Bandoro town, Central African Republic (CAR). 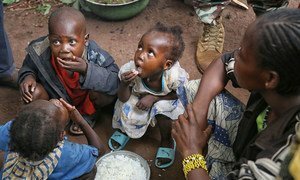 The United Nations food relief agency is providing emergency aid to 8,000 people affected by an upsurge in violence in the north of the Central African Republic (CAR), in addition to regular food and nutrition support for some 120,000 people. “This seemingly never-ending cycle of violence is extremely worrying. We see formerly displaced people returning to their homes only to be uprooted again, or people simply unable to return as their areas of origin remain unsafe,” said the Deputy Director of the World Food Programme (WFP) for the country, Rocco Leone. According to a news release issued yesterday by WFP, emergency food distributions began on 17 October in Kaga Bandoro region, where fighting has killed or wounded dozens. Initial 15-day rations of rice, pulses, vegetable oil, corn-soya blend and salt have so far been distributed to 5,000 people seeking protection outside the base of the UN peacekeeping mission in Kaga Bandoro town, and to a further 3,000 people in the town of Ganama. Mr. Leone said that more people in need of urgent assistance have been identified in the areas that have seen severe fighting. Over the next three months, WFP plans to assist an additional 17,000 people with food or food vouchers. “We are determined to continue providing life-saving assistance – in any way we can and despite limited resources,” he said. In 2016, WFP and its partners plan to assist 1.4 million people in the areas of CAR worst hit by conflict and hunger. But with only 44 per cent of funding needs met, the agency urgently requires $42 million to keep doing so, he added.